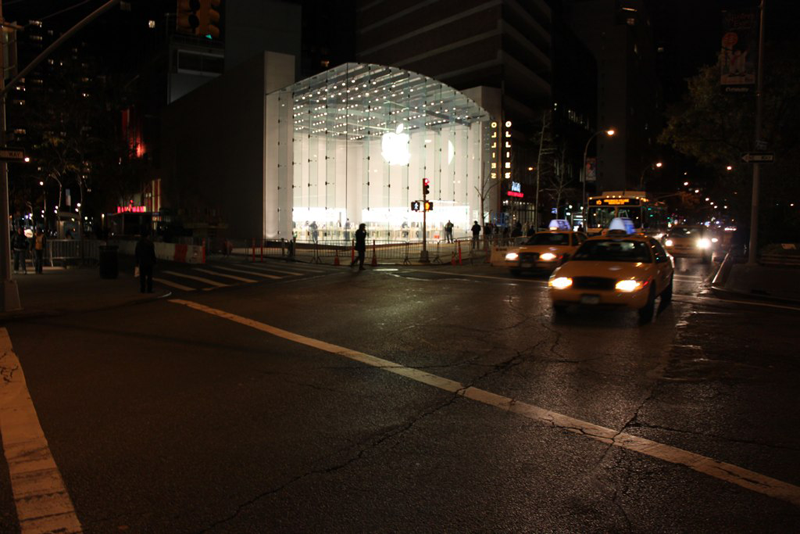 Apple Thursday gave a first look at its new New York City store located on Broadway at 67th street, set to officially open to the public this Saturday at 10 a.m. The store will be home to a "highly trained team" of more than 200 employees. The impressive building at 1981 Broadway features a unique curved glass roof and glass front. The storefront is 54 feet tall, 75 feet wide and 30 feet deep. 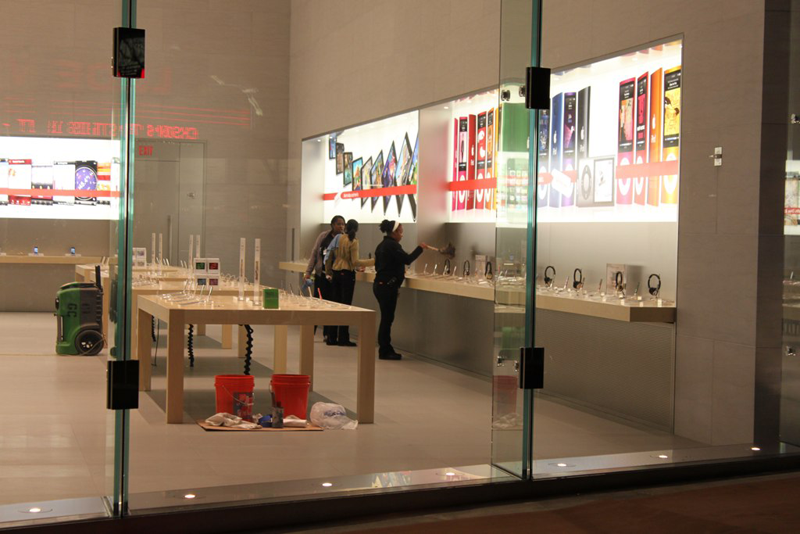 "We opened our first store in Manhattan seven years ago, and the response has been incredible," said Ron Johnson, Apples senior vice president of Retail. "We hope our new store on the Upper West Side will become as much a part of the community as our stores in SoHo, the Meatpacking District and on Fifth Avenue." The first 2,500 visitors to the store on Friday will receive a limited edition commemorative t-shirt. Gary Allen at ifoAppleStore was present at the store Wednesday night after Apple removed a graphic that was concealing the glass storefront. It revealed a single stone-walled room lit by ceiling lights at night, and flooded with sunlight during the day. 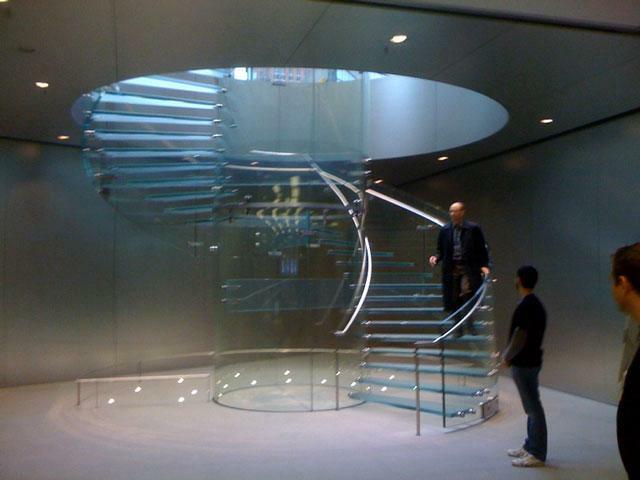 The ground-level space includes four rows of display tables, and a spiral glass staircase leading down to a lower level. 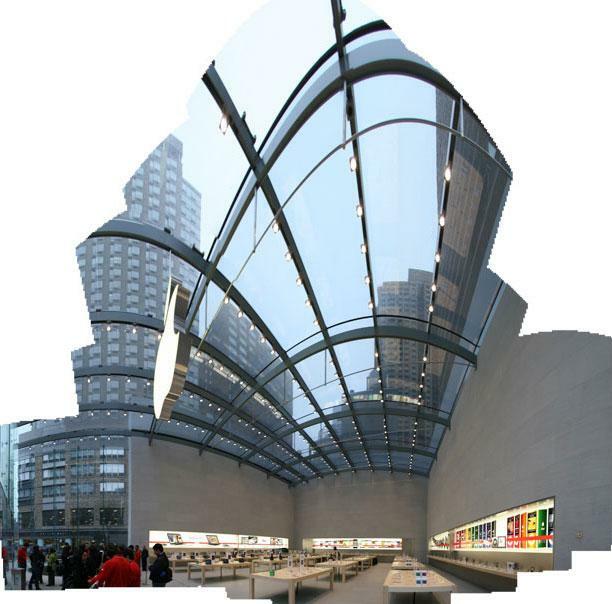 Allen said the size and scale of the store eclipses that of any previous Apple store. More photos and information are available at ifoAppleStore. Gothamist was at Thursday's press event, and offers a number of photos from inside the new store. Speaking at an event at the new store Thursday morning, Johnson said that the company realized their stores were too small, so all future locations will be at least "three tables wide." According to Gizmodo, the company also plans to accelerate its opening of stores next year, with 50 new locations set to debut in 2010. 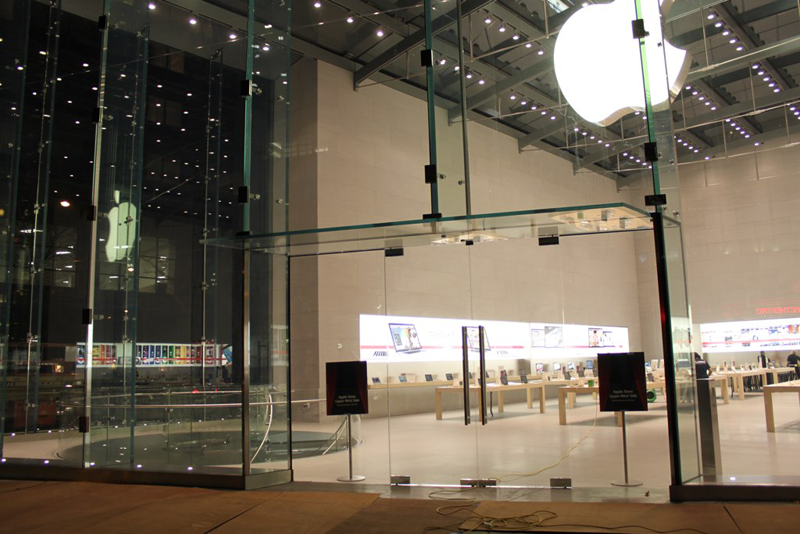 The Mac maker also plans to have more "significant stores" that attract attention, like its flagship locations in New York City —in particular the 5th Ave. store covered by a glass cube and open 24 hours a day, 365 days a year. Johnson said that more than 10,000 people applied to work at the new Upper West Side store, though only about 200 were hired. 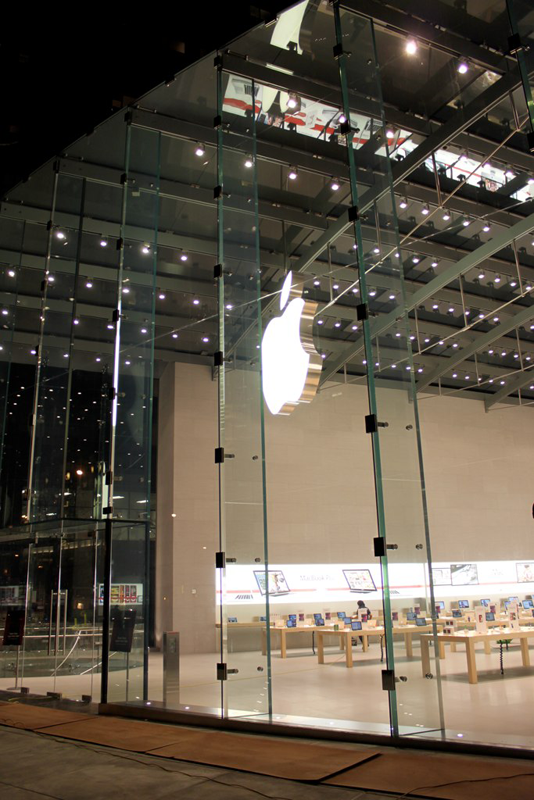 The average Apple store sells about $26 million, or $4,300 per square foot. The growth of Apple's stores has been impressive. Johnson said that the entire company did $5.4 billion in sales in 2001, while the stores alone have sold $6.6 billion in 2009. The company's total 2009 sales reportedly amount to $36.5 billion. Last week, Apple announced that its stores would allow a new "Reserve and Pick Up" option via its retail Web site, allowing customers to reserve products online and pick them up in the store. The new system aims to allow holiday shoppers the ability to ensure their products will be available for them to purchase between Dec. 15 and Dec. 24.